I’m delighted to announce that the first App from our co-publication deal with Collca is in the iTunes Store today. 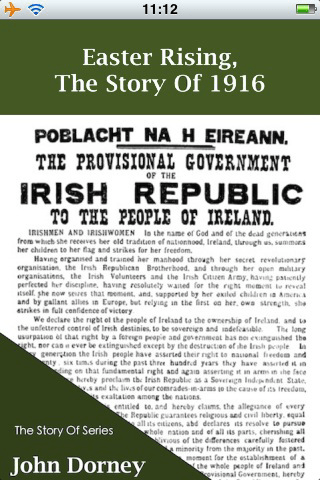 The App is based on John Dorney’s excellent book (available here) on the 1916 Rising. The app costs €2.39 in the App store and features some nice additions that the app makes possible. I’m really delighted to get to this point and I hope everyone who buys and downloads the app enjoys it. Part of my goal at The Irish Story is to use new technology to push history out into the world and to reach as many people as possible with it. This is just one more way of doing that. So, go and buy it! Then let us know what you think. Written by: Eoinpurcell on 23 November, 2010.on 19 April, 2011.